More than 44 000 pieces of Checkers Championship Boerewors have been tasted and judged by a panel of chefs from the South African Chefs Association every year since the inception of the competition 22 years ago. Jenny Morris creates a delicious twist on this old braai favourite, which the whole family will love. This can be served as a light lunch or the perfect summer dinner with a fresh salad. Get the kids to jump in and help with the preparation. Heat the olive oil and add the onions. Cook them down slowly until they’re golden and sweet. Cool them right down and then place them in a bowl and stir in the coriander, garlic, sweet chilli sauce and feta cheese. Season with salt and pepper. 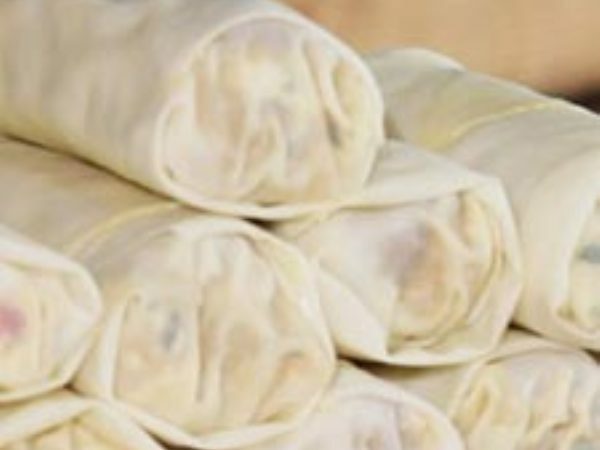 Lay your spring roll wrappers on a flat surface so you have a diamond shape, with the one tip pointing towards you. Brush each with the egg wash.
Place the cooked boerewors and the onion mixture on the corner closest to you, and fold it over. Repeat until you have enough spring rolls. Preheat the oil to 180 °C and fry the spring rolls until crisp and golden. Serve with sweet chilli sauce.